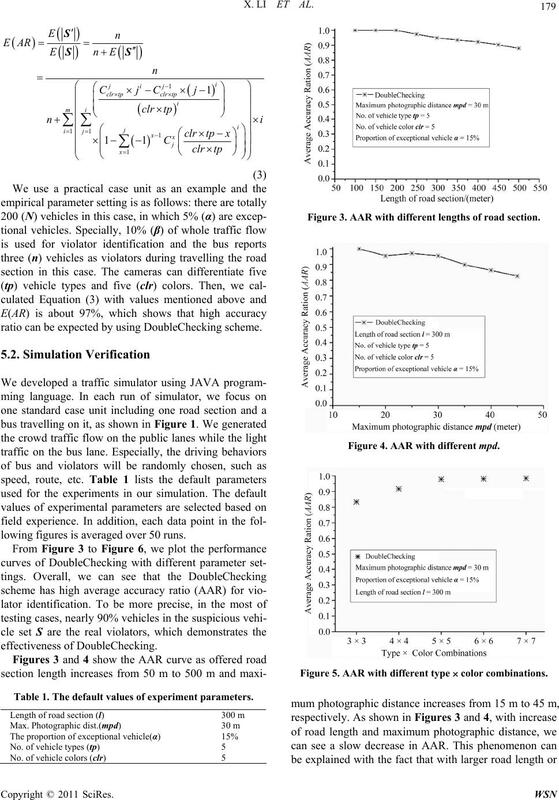 bleChecking yields good performance for violator identification. bus mounted system is the limited surveillance coverage. based on wireless communications between cameras. Figure 1. 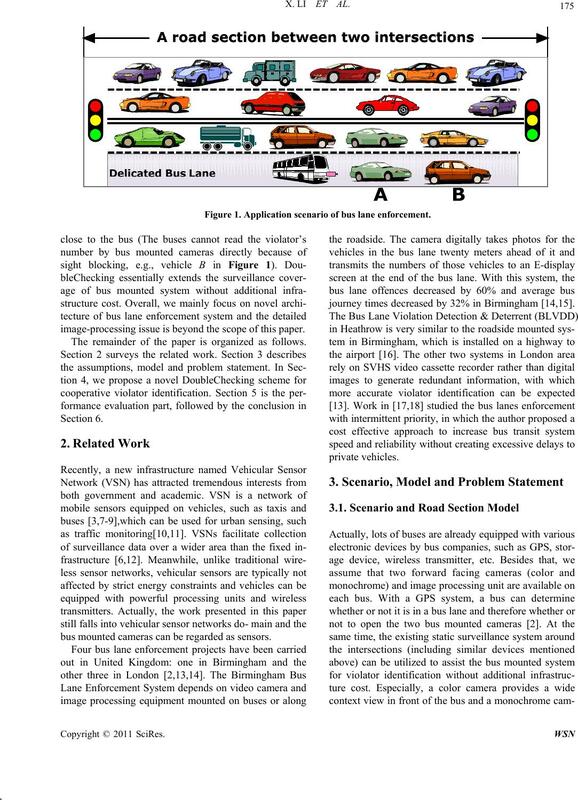 Application scenario of bus lane enforcement. 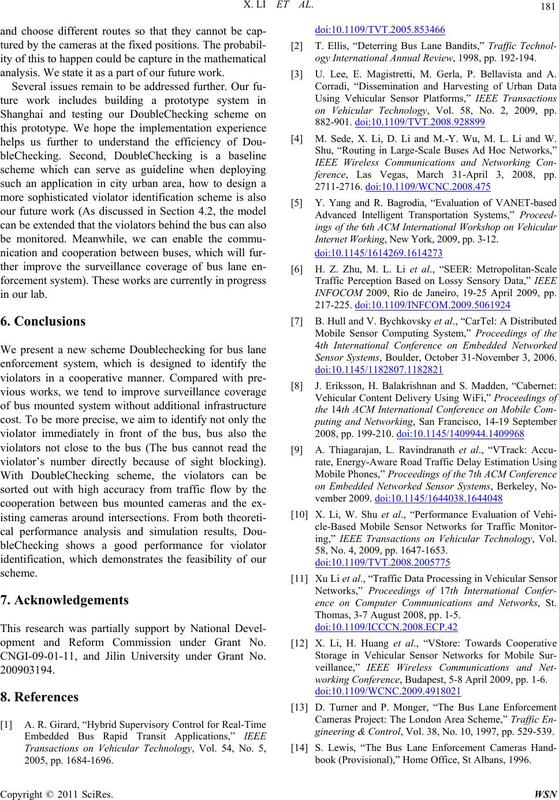 image-processing issue is beyond the scope of this paper. bus mounted cameras can be regarded as sensors. journey times decreased by 32% in Birmingham [14,15]. 176 X. LI ET AL. era shows a close up view of the vehicle’s number plate. (high position, good orientation, as shown in Figure 1). hicle to be a violator if all lanes have similar traffic). set S by cooperative violator identification? First, we introduce some definitions as follows. 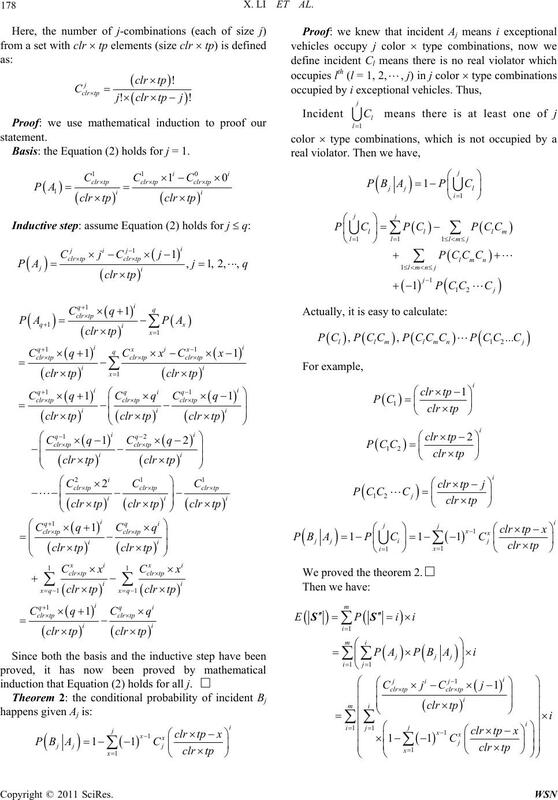 this paper, related works can be found in [19-21]. set but are not the real violators. front of the bus can be obtained by monochrome camera. 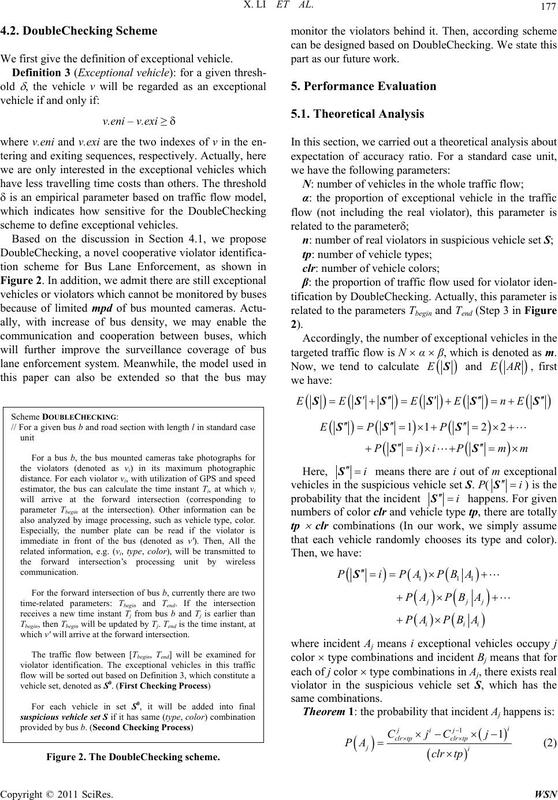 violators in the whole traffic flow by GPS coordinates. have illegally utilized the bus lane as a violator. the location information of violators provided by bus. from the bus, such as vehicle type and color, etc. We first give the definition of exceptional vehicle. scheme to define exceptional vehicles. 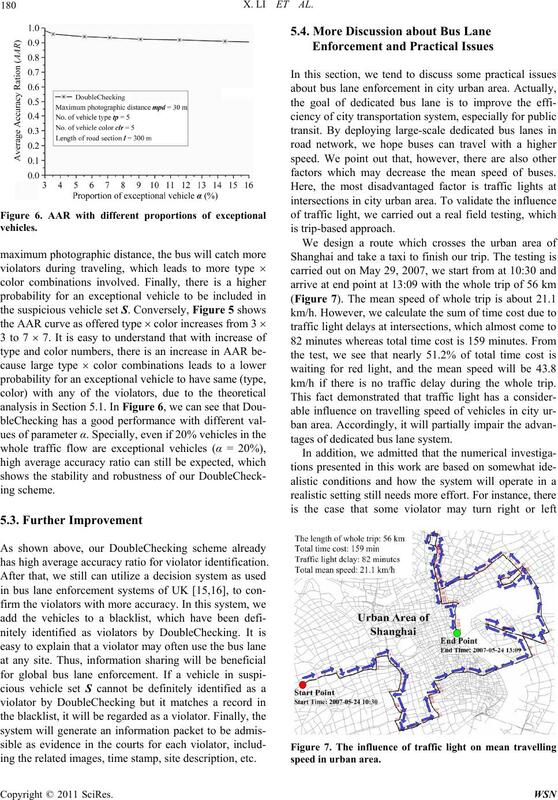 also analyzed by image processing, such as vehicle type, color. which v' will arrive at the forward intersection. Figure 2. The DoubleChecking scheme. part as our future work. targeted traffic flow is N  α  β, which is denoted as m.
that each vehicle randomly chooses its type and color). 178 X. LI ET AL. Basis: the Equation (2) holds for j = 1.
induction that Equation (2) holds for all j.
ratio can be expected by using DoubleChecking scheme. lowing figures is averaged over 50 runs. Table 1. The default values of experiment par amete r s.
Figure 3. AAR with different lengths of road section. Figure 4. AAR with different mpd. Figure 5. AAR with different type  color combinations. 180 X. LI ET AL. has high average accuracy ratio for violator identification. ing the related images, time stamp, site description, etc. factors which may decrease the mean speed of buses. km/h if there is no traffic delay during the whole trip. tages of dedicated bus lane system. analysis. We state it as a part of our future work. violator’s number directly because of sight blocking). opment and Reform Commission under Grant No. 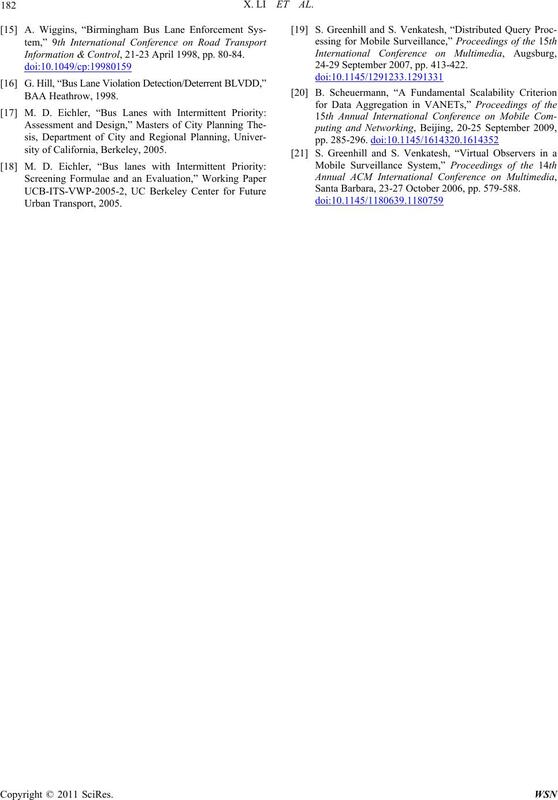 CNGI-09-01-11, and Jilin University under Grant No. ogy International Annual Review, 1998, pp. 192-194. 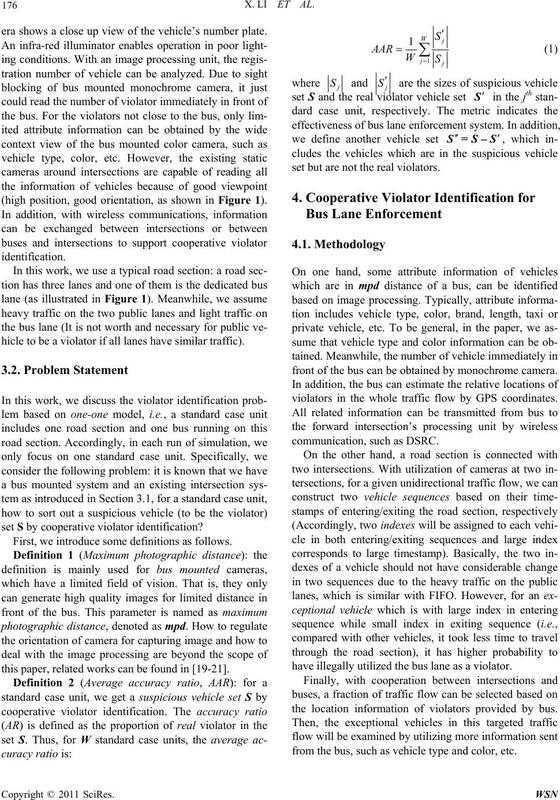 U. Lee, E. Magistretti, M. Gerla, P. Bellavista and A.
on Vehicular Technology, Vol. 58, No. 2, 2009, pp. M. Sede, X. Li, D. Li and M.-Y. Wu, M. L. Li and W.
ference, Las Vegas, March 31-April 3, 2008, pp. Internet Working, New York, 2009, pp. 3-12. INFOCOM 2009, Rio de Janeiro, 19-25 April 2009, pp. 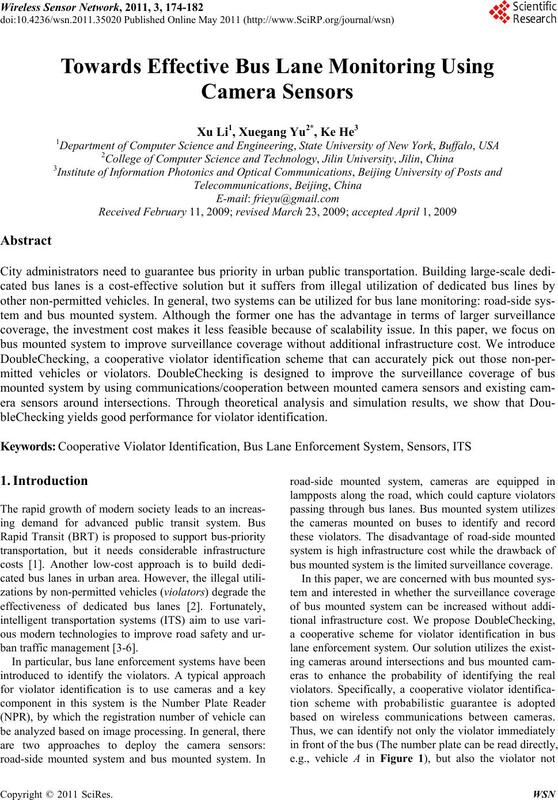 Sensor Systems, Boulder, October 31-November 3, 2006.
ing,” IEEE Transactions on Vehicular Technology, Vol. 58, No. 4, 2009, pp. 1647-1653.
ence on Computer Communications and Networks, St.
Thomas, 3-7 August 2008, pp. 1-5.
working Conference, Budapest, 5-8 April 2009, pp. 1-6.
gineering & Control, Vol. 38, No. 10, 1997, pp. 529-539.
book (Provisional),” Home Office, St Albans, 1996. Information & Control, 21-23 April 1998, pp. 80-84.
sity of California, Berkeley, 2005. 24-29 September 2007, pp. 413-422. Santa Barbara, 23-27 October 2006, pp. 579-588.